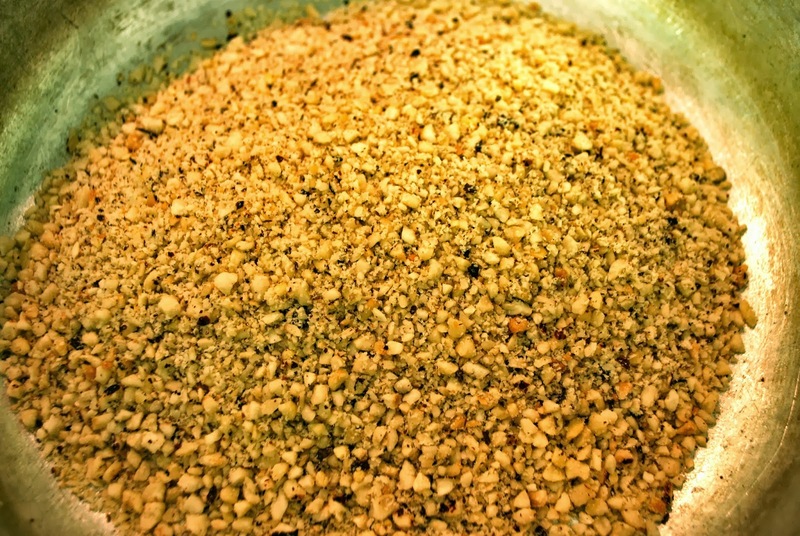 Today I’m going to be sharing a recipe on how to make nut flour or nut meal. Whether you want to call it one or the other, is all up to you. 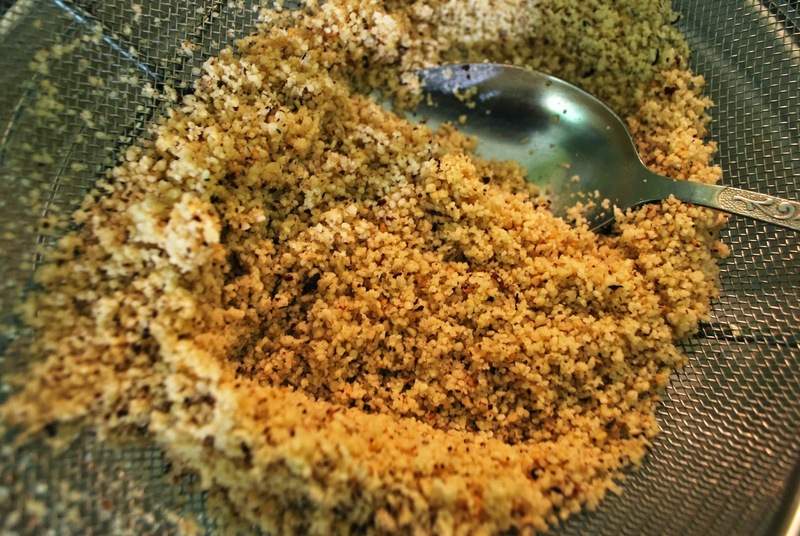 I find that using this recipe, I can get a pretty good almond flour but when using hazelnuts, it’s more of a meal not flour. So it really depends on the nuts you’re using. NB! I haven’t used this flour recipe for actual breads or pastries. It might not work for those kind of things, I’m not 100% sure. But this recipe does work for waffles, pancakes, cheesecake bases, cookies etc. First of all, you start by roasting your nuts. I unfortunately forgot to take pictures of that step. Heat your oven to about 180–200 degrees Celsius, put your nuts in a tray and in the oven. Mix every couple of minutes or even more often. It is very easy to burn your nuts, so be very careful and keep your eye on them at all times. 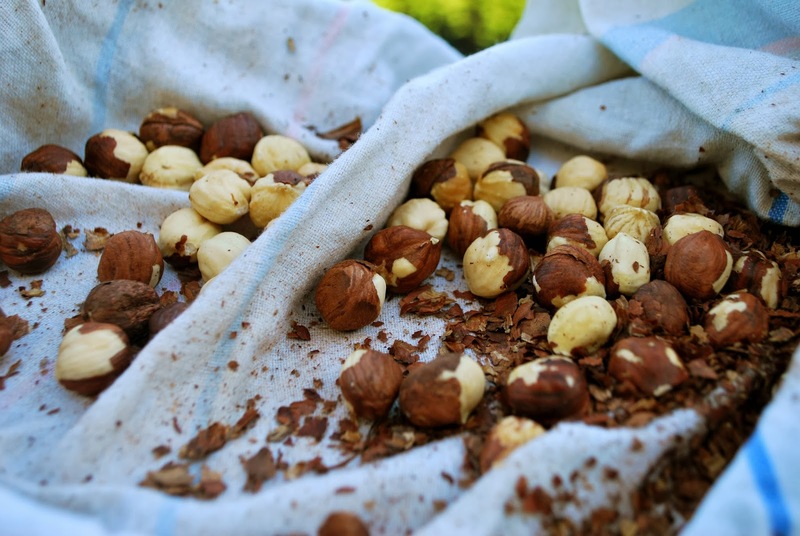 Once the nuts are golden brown in color, fragrant and start to shed skins (if they have skins like almonds and hazelnuts), take them out and let them cool of a bit. Next put them in a clean kitchen towel and rub well. The skins will start to come off. In the summer it’s great to do that outside because the skins will want to go everywhere. Now it’s time to take out your food processor or blender of coffee grinder. Place the nuts in there and start blitzing. don’t blitz for too long, otherwise you will release too much oils in the nuts and you get nut butter (which tastes yummy!) and that you won’ be abled to use as flour anymore. Once you’ve grinded the nuts for some time, place them in a fine sieve. Start sifting the flour into a large bowl. 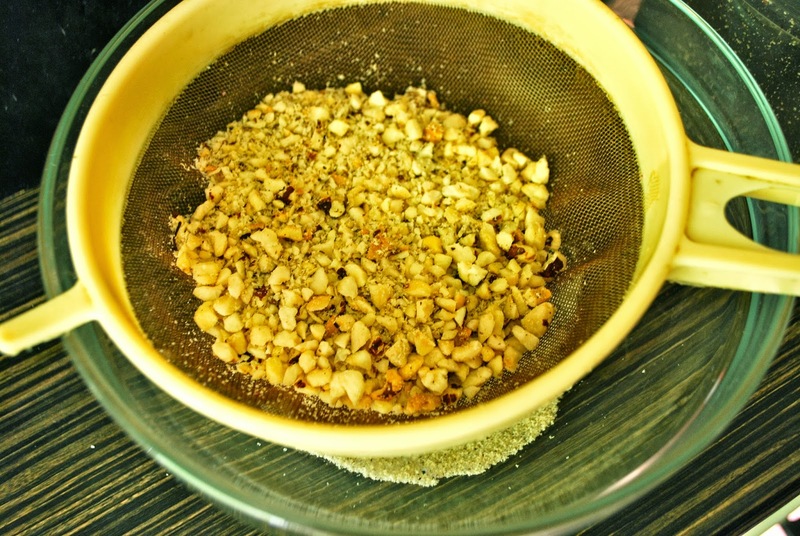 If you have grinded a lot of nuts, do this step in smaller batches, it’s easier that way. That I would call nut meal because it’s not as fine as the flour in a picture before (in the jar). 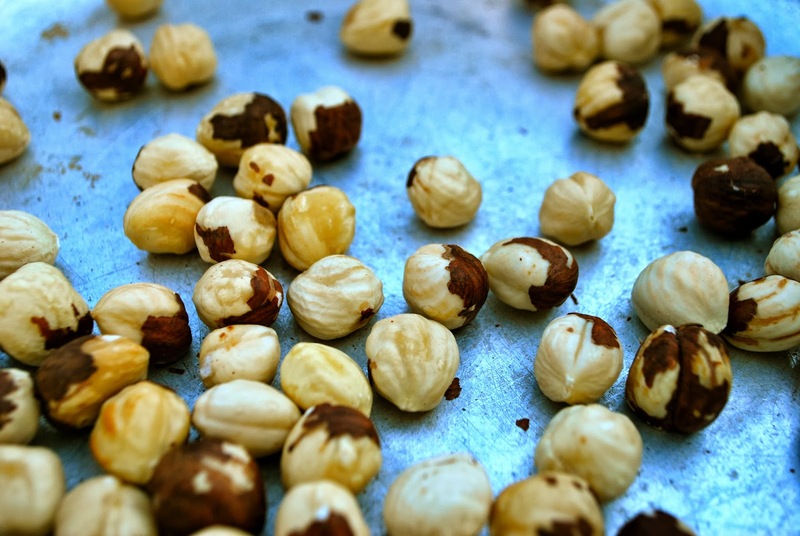 You get relatively a lot of meal from hazelnuts and less flour. It’s vice versa with almonds. 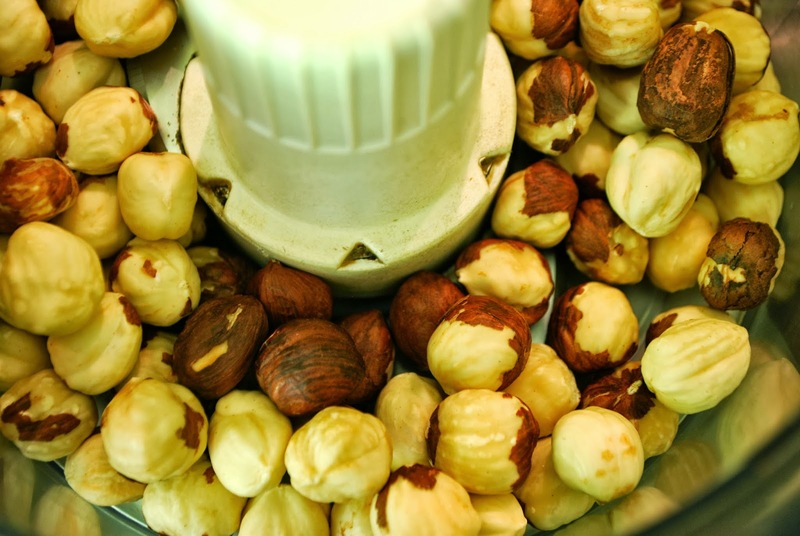 Now you have two options: you can mix the fine nut meal with your nut flour or put the meal and flour in separate jars. If you look closely, you can see the flour in the bottom of the jar and meal on the top. 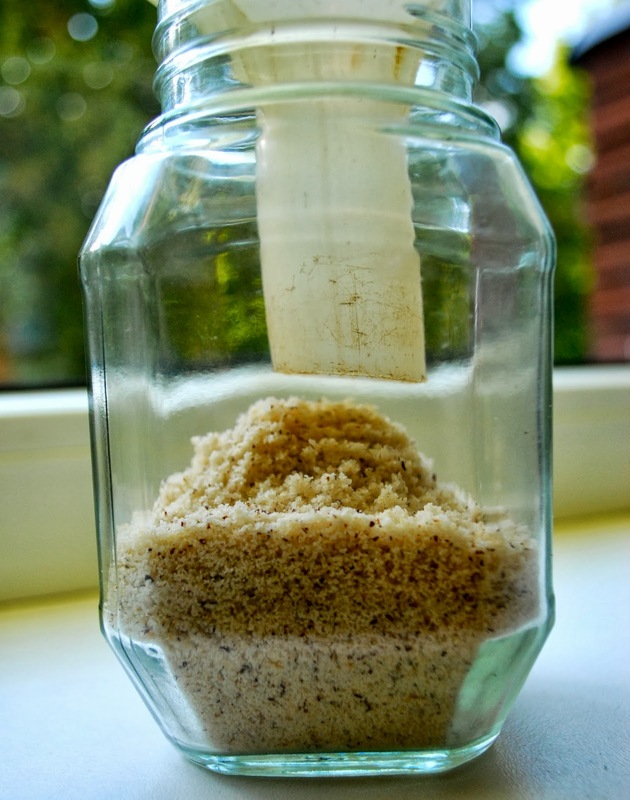 Since I used this for my LCHF cheesecake base, it worked well with the flour and meal mixed together. If you want to bake breads, muffins etc, I would not use the meal. It might work but I’m not 100% sure it will. Give it a try but if it doesn’t work: I’ve warned you. If you are making a cheesecake base, cookies, waffles or pancakes, you can mix the flour with the nut meal and it will work just fine. Nutrition information depends on the nuts you are using. To see nutrition facts of all kinds of nuts and seeds, check out this post.